AI, machine learning and embeddables have the power to transform the healthcare industry. There is a huge amount of pressure on healthcare services today with much written about the resulting impact on patient care. You only need to reflect on the recent election campaign to see what an emotive issue it remains throughout the UK. What’s also true is that advanced technology is taking a bigger role in healthcare than ever before, looking to alleviate some of the burdens on our health systems and provide greater support for our wellbeing. One clear theme underpinning this shift is applications. 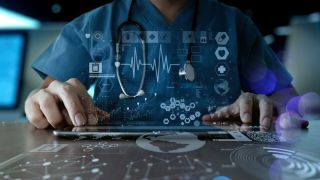 Whether being used by organisations to adapt and streamline processes to improve data access and patient care or by patients themselves looking at ways to better understand and manage their health, the sector is set to be transformed by the evolution of apps. F5 Networks recently commissioned a report called The Future of Apps conducted by the Foresight Factory, which unveils some fascinating insights into major trends and projections that will significantly impact society over the next decade. The findings include important trends that will affect the future of healthcare, including artificial intelligence and how embeddables (i.e. implants of RFID or NFC chips) are set to transform how we monitor and take care of our bodies. The developmental trajectory of future apps will be heavily influenced by AI and machine learning. In the arena of health and wellbeing, around half (49%) of consumers in Europe and South Africa would like to be able to understand the impact of dietary choices made today on their future health, rising to 57% of Gen Y and peaking at nearly two thirds (64%) of Gen Y in France and Spain. Taking this a step further, we are starting to see that AI and chatbots are being embraced via branded apps, in order to deliver a more personalised, ‘intelligent’ service to customers. In the UK, Babylon Health is trialling an AI-powered app in conjunction with the National Health Service (NHS) until July 2017. Users submit their symptoms to the app to receive a recommended action – drawing on algorithms, clinicians and data analytics. The average time to complete an interaction on Babylon is 12 minutes. Emerging innovation in the health sector indicates the potential for transformation in the provision of healthcare with cognitive apps set to be instrumental in improving patient outcomes and achieving significant cost savings. Medtronic is one of many organisations working with IBM’s Watson AI platform to bring new solutions to market. Focusing on diabetes management, the companies claim to have developed the first ‘cognitive app’, Sugar.IQ. Using 10,000 anonymous patient records, Sugar.IQ acts as a personal assistant and can detect patterns and predict diabetic events three to four hours before they happen, with a 75% to 86% accuracy rate. The personalised feed helps patients better understand how their behaviour affects their glucose levels in real time. With the number of people with diabetes in Europe forecast to rise from 59.8 million in 2015 to 71.1 million in 2040, such apps have the potential to make a dramatic impact by putting sophisticated healthcare into the hands of the patient. For consumers, such tools will depend on allowing companies continuous access to a raft of much more personal data, such as biometrics, alongside contextual information (e.g. location). Advances in wearables or embeddables will make the process significantly more intuitive and convenient, but users will face new considerations in terms of unprecedented intimacy with certain organisations and brands, as well as increased levels of risk in terms of data privacy. The level of ‘owner effort’ required will remain an important factor, and potential barrier, to users extracting maximum value from AI apps and capabilities in the medium term. Half of consumers within Europe and South Africa say they are often under time pressure day-to-day. It will be essential for future apps and app eco-systems to alleviate rather than aggravate this sense of stress. A significant time investment to ‘teach’ devices is likely to be unwelcome, and users will need to see clear value from more widespread data sharing and analysis. While certainly not widespread, there is also an emerging market for embeddables, which enable users to undertake various functions, such as unlocking their car or phone with a swipe of their hand - after all, it wasn’t that long ago that keyless entry into vehicles looked like sci-fi but technology has quickly developed, something which is likely to be reflected in health. In medicine, current research is exploring the scope of implants to help create a memory. Kernel, a new US-based “human intelligence” company, is developing a neuroprosthesis that could “mimic, repair and improve cognition”. The company aims to create an implantable chip, which sits in the hippocampus region of the brain and can electrically stimulate certain neurons. By trying to replicate the way the brain cells communicate with each other, it could help those with dementia or a brain injury to be able to create long-term memories again. A pioneer in this field of human enhancement or ‘transhumanism’ is Neil Harbisson, artist and co-founder of the Cyborg Foundation. When Harbisson was born, he was only able to see in shades of grey, leading to him having a connected antenna implanted in his skull. The antenna allows him to perceive visible and invisible colours, such as infrareds and ultraviolets, via sound waves. Via the antenna, Harbisson is also able to receive images, videos, music or phone calls directly into his head via external devices such as mobile phones or satellites. He is now focused on designing a new ‘organ’, which will be controlled via an external app and bring a further dimension to his senses. Harbisson’s attitudes toward merging his body with technology may seem extreme to some, but with the rise of 3D-printed biological materials, there will be far more possibilities to augment our anatomy in future. Over a 10 year horizon, a minority of consumers are likely to take such steps. However, it raises the possibility of a radically different genre of apps that enable users to alter or augment their senses. These apps will be, effectively, a remote control for the human body. Though themes such as AI and embeddables are unlikely to become mainstream in the short term, what’s certain is that there is growing pressure on the healthcare sector to transform its services and capabilities. Demands are changing at a lightning pace and security concerns are surging. The Future of Apps report indicates how technology and our bodies are set to become increasingly intertwined. In the short term, I expect to see applications span the gap between our bodies and technology, enabling organisations and individuals to have a better understanding of their healthcare and the impact this will have on treatments or lifestyle. What’s also true is that this is set to create immense opportunities for those capable of delivering these apps with speed, adaptive functionality and security. Based on discussions I’ve had with business leaders in the healthcare sector, many organisations are only just starting to reap the benefits of applications and are still concerned about the resulting security implications of moving too quickly and opening themselves up to threats, such as when Barnaby Jack successfully hacked into a pacemaker. Looking ahead, access to growing sets of personal data, combined with the ability to process and manage such information locally, will create new opportunities for consumers to become gatekeepers over their own data. I believe the need for greater transparency, combined with emerging business models and processes, will drive more people to call for the healthcare industry to safeguard data and improve overall application security standards. What’s essential is that healthcare organisations keep pace with innovation and make committed plans aligned with the Future of Apps.